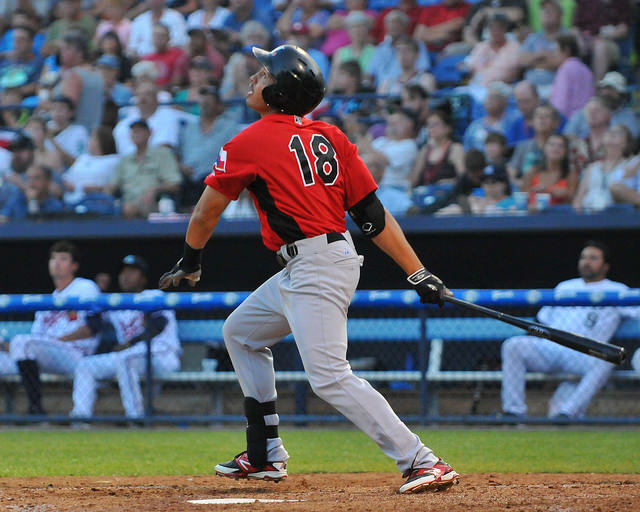 Luke Tendler came out of the gate in April as the hottest hitter in the South Atlantic League. The 29th round pick of the Texas Rangers in 2014 out of North Carolina A&T received the SAL’s first hitter of the week award for the 2015 season. 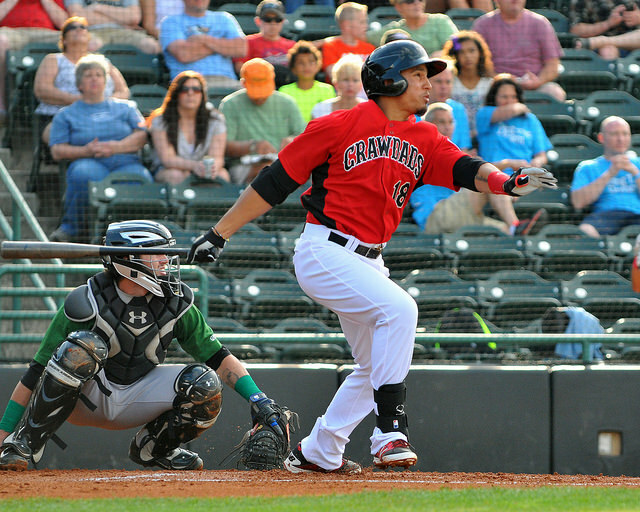 He also took home the Rangers minor league player of the month award after posting a .346/.378/.705 slash with five homers, 11 doubles and 10 RBI. Tendler still held a .325/.385/.561 line as late as May 14 before hitting a 17-for-102 tailspin that dropped his overall slash to .254/.316/.405 to end the first half. The Wilmington, NC native still had enough to earn a starting spot for the Northern Division in the SAL’s All-Star Game last week and hit a homer in the second inning to end a two-month power drought. He has hits in six of his last eight games, including a three-hit night on June 25 that ended with Tendler’s walk-off single. I talked with Tendler about the prolonged slump, how he dealt with the confidence factor that happens during the period, and the difference in making adjustments in the pros as opposed to the college level. Let me first ask you about the all-star game. I know with the drought of home runs for you over the last two months, it had to feel good to get a first-pitch fastball and drill one. Tendler: It was definitely a good feeling. I hadn’t had that feeling in a while just coming off the bat like that. It felt great and it definitely gave me a little bit of confidence going into the second half. What was your favorite part about the whole All-Star Game? Tendler: Just being there with all the guys at one time and just talking about when we played them: this pitch, what pitch you hit and a lot of junk talking with a bunch of guys. At the same time, it was a lot of fun. I’d like you to take me through your year a little bit. I know it’s been a roller coaster year. You started strong. Talk me through the first part and then where it’s gone down. Tendler: When I came in, I was hot off the get-go and I was smoking hot. The next thing you know, I had a couple of rough nights and then it turned into a long slump for me. I just try and stay positive each and every day, to come out and get better and try to work my way out of it. You’ve got to know that’s part of baseball. That’s what I keep in the back of my head and try to stay positive. How much of the down time for you was either mechanical or something in the swing versus just the confidence factor? How much tinkering have you done, either with Frankie (Crawdads hitting coach Francisco Matos) or with Josue (Rangers minor league hitting coordinator Josue Perez) coming in? Tendler: Not much, just little things here and there that they see. Usually, it’s not the swing; it’s just going out there hitting and trying to get your confidence back. It’s little adjustments they’re always making just to help you get better. How much of the downturn is just seeing better pitchers? There are guys that run out here nearly every night that I’m guessing you didn’t see a whole lot of in Greensboro. Tendler: Yeah, without a doubt. The professional pitchers throw a lot better than the college pitchers throw. But at the same time, I don’t feel overmatched at any point at this level. That’s why, when I do get into a slump I don’t see it as the pitcher making great pitches; it’s just me not making the swings I should be making and not making the proper adjustments I should be making. I don’t feel overmatched at all. How have you seen on the mound, that you can recall, that did give you some issues, where you’re get something worked out, but he’d throw a pitch you hadn’t seen before, maybe in a count you weren’t expecting to see it? Tendler: A lot of guys, especially when I started getting into the slump. Right then, it seemed like all of the pitchers were better than what they were and making pitches. They were throwing changeups when I was counting on seeing fastballs in. But I mean, for the most part, when I start going bad, the hardest thing to hit is a lefty. When I’m going good, I can hit lefties or righties. The first thing is lefties giving me a hard time when I’m not right. You started the last week of the season and on the last homestand to come out of the funk a little bit. You had the homer at the all-star game and a good game last night (3 hits, 3 RBI, including a walk-off single vs. Lakewood on June 25), what’s been the thing to prime the pump? Tendler: Just going out there and forgetting about the past and looking at every day as a new day knowing that it’s a new day. I knew that as long as I stuck it out that I would get out of it. I knew I would. I knew I had to keep on working and keep on swinging. Finally, I started catching a few barrels in the game and starting feeling good. I just tried to keep repeating that swing over and over again. That’s where I’m at now. I talk with Josue a couple of weeks about college and adjustments they’ve had to make. He said that you guys have already had to make adjustments or you wouldn’t be here. You’ve had to learn to do that before. What’s different about making adjustments here as opposed to making adjustments in college? Tendler: The biggest difference in college is if you prove you can hit in college, they just don’t throw you fastballs no more. It don’t matter what count it is, you’re always seeing offspeed pitches – changeups, curveballs – and they don’t care if they walk you. They’d rather walk you or make you hit some of their junk than you hit a home run off their fastball. That’s the biggest difference, just being patient in college. You get into pro ball, the biggest adjustment is getting back to hitting fastballs – not missing the fastball. In college, you’re not used to seeing that many fastballs. You get into pro ball it’s a lot more fastballs that guys throw to the hitter. That’s the biggest adjustment so far. Who’s been the biggest help so far in maybe something they’ve said that’s helped things to click? Tendler: All three of our hitting guys have helped with the swing. Obviously our hitting coach here, Francisco Matos, has helped me a lot. Then when Josue comes into town, he helps me big time. The hitting coordinator Dwayne Murphy helps me a lot, too. Another thing, I talk to my college hitting coach quite a bit. He always talks to me and wants to know where I’m at, and where I’m at in my swing and what do I feel. He actually knows my swing better than anybody. When you roll out of here at the end of the season, what does a successful year look like for you? Tendler: I look at a successful year a lot of different ways. Obviously, home runs is a big time thing- hitting 15 plus would be a plus, in my opinion. Average wise, I think a .265 plus year is considered a good year, in my opinion. I want to hit .275, .280; really, I could hit .300, that’s what’s considered a good year, in my opinion. Looking way ahead when you get a call to the major leagues, what does that look like for you? What do you think will be most memorable for you and who will it mean the most to you? Tendler: It would mean the most to me, for one. After that, my mom and my day, my grandfather and my sister, they’ll be right after me in happiness and how much it would mean. The day that happens, I would want to see my family in the stands that first game. Is there something that you would look back to and say, this was worth it? Tendler: In this game, definitely, if you make it to the big leagues, all of the minor leagues will be worth it. No matter how many years you’ve been there. If I make it, I don’t because I haven’t been there yet, but I’m sure every minor league game you’ve played will be worth it. What’s been the best part of your season? Tendler: The best part of my season this year is probably just winning the first half. Going out and being with the group of guys is a lot of fun. They like to play hard every night and bring it every night. That’s been the best part of my season is going out and having fun and winning baseball games.